‘What would happen if a black hole gobbled up the ISS?’ Wow, and you were just worrying about what flavour Pizza to have when you got back to Earth, Tim!! Just one of the hundreds of questions that children have been asking me at primary schools throughout the UK. Their fascination with space, astronomy and Tim Peake has really taken off. Their imagination has been boundless with space projects, art-work, rockets, space suits. 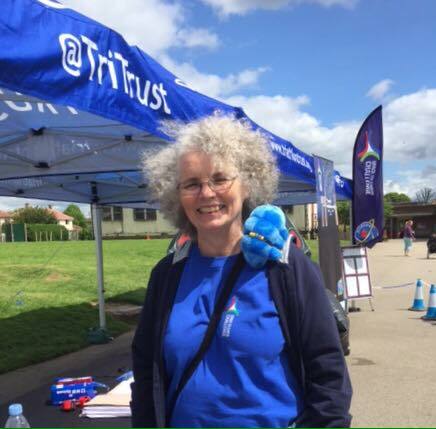 It has been a great honour to be part of the Space2Earth Challenge team, led by Heather, with so many other enthusiastic participants, in particular the Tri Trust. Indeed yes, I have actually joined in the physical exercise challenge, and been on a bike, but apparently my legs were moving so fast that the photo just came out as a blurr! Triton, the tardigarde has also joined us on some of our adventures. Tim’s support from space has been so important, we’ve shared his adventures, his training, his spacewalk and his beautiful photos of Earth, sunsets and the aurora. I could not possibly list all of the wonderful encounters with the children or all of their questions. I usually go home from a school pretty exhausted but also very happy. One young lady said ‘I have two questions: How will the Sun die? When did you get interested in science?’ Great questions. Our aim has simply been to work with Tim and the UK Space Agency to inspire the next generation. This work is far from over, even when Tim gets back to Earth, so keep going and earning those Space2Earth Challenge badges.